How much does the Earth and its population weigh? Planet Earth has a mass of 5.972 × 10^24 kg, something we’ve known since the 18th century. By one estimate, the total world population mass or ‘global biomass’ is of around 287 million tonnes. How much does the whole human population weigh? 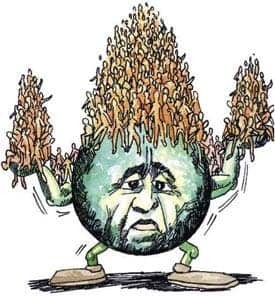 Researchers evaluated the impact humans have on the environment by calculating the total mass of the population, instead of actually counting heads. To find out how much humanity weighs, British researchers simply calculated the product of population size and average body mass.Their findings conclude that humanity weighs as much as 5,400 Titanics or 287 million tonnes. “When people talk about sustainability, they quickly get into concerns about population,” says Ian Roberts of the London School of Hygiene & Tropical Medicine in the UK. The sheer number of human individuals, however, fails to measure properly the real impact of our race. By evaluating weight, scientists hope to provide data that is easy to read and more adaptable to modeling extra factors, like over-consumption. “This is a statistic that measures both,” Roberts says. For their study, the researchers employed data from a 2005 census, which also had information regarding body mass index (BMI) and average height. Body mass index is defined as the individual’s body mass divided by the square of a person’s height and serves as a reliable indicator. If you’d like to know if you’re underweight, normal, overweight or obese, check this graph (in pounds). By factoring in population data, distributed over each country, the researchers concluded that the total adult population of the world weighed 287 million tonnes; the true figure, however, is larger as this estimate doesn’t include children. Also, the world’s population is far greater than in 2005 now totaling 7.5 billion. Of the total world population mass, 15 million tonnes were attributed to individuals who were overweight. Speaking of which, 34 percent of the global biomass attributed to obesity is found in North America despite the continent houses only 6% of the world population. In contrast, Asia has 61% of the world population but contains only 13% of the biomass attributed to obesity. If all countries had the same BMI as the United States, the added biomass would be equivalent to an extra 935 million people of average body mass, as reported in BMC Public Health. In many ways, measuring the mass of Earth is easier than measuring that of its population. In fact, it’s as easy as you would measure your own weight on a scale. What a scale does is measure how hard Earth’s gravity is pulling you. 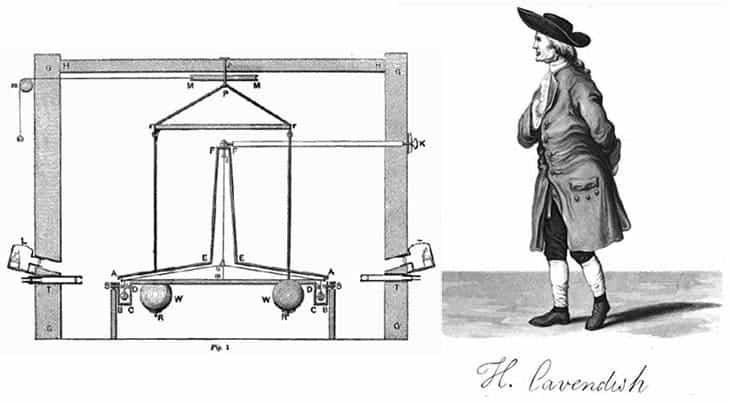 The first to measure how much Earth weighs was the eminent scientist Henry Cavendish in 1798. Cavendish made his own experimental apparatus which looked much like a large dumbbell with two-inch lead spheres stuck to the ends of a six-foot rod. A wire was tied to the rod’s center of mass, keeping the rod suspended and free to move. A second, much larger dumbbell, this time carrying twelve-inch 350-pound lead spheres, was put near the first one so the larger spheres would attract the smaller ones. This exerted a small torque on the suspended rod. Cavendish reportedly would watch for hours as the rods oscillated, always taking measures to minimize outside factors like air movements and so on. Eventually, the oscillation could be used to measure the gravitational force of the larger sphere on the smaller one. The density of the spheres is known, so the ratio of the two forces could be used to determine Earth’s density (volume/mass). He reported that the density of Earth was 5.48 times the density of water, which was stunningly accurate considering the currently accepted value is 5.52. From here it’s very simple. It’s all a matter of multiplying the density of the planet by its volume to find the mass, which is roughly 5.972 × 10^24 kg. As for Earth’s weight, a relative term that refers to a measure of the gravitational forces acting on a body, it has a value of 3.52 x 10^22 Newtons considering the sun’s gravitational field. Here’s an interesting fact: the planet is losing more mass than it gains. Every day dust, comets, and meteors breach the atmosphere and land on Earth, adding to its mass. At the same time, mass is lost as gases escape our atmosphere. According to Dr Chris Smith, a medical microbiologist and broadcaster who tries to improve the public understanding of science, every year the planet adds 40,000 tonnes of mass from space dust, but loses 95,000 tonnes of hydrogen and 1,600 tonnes of helium. That’s a net loss of 50,000 tonnes each year or 0.000000000000001%. Not to be worried though. It would take trillions of years for all the hydrogen on the planet to get depleted but we can’t the same about our helium resource. Some have cautioned the world could run out of helium in the next three decades at the current rate we’re squandering it.